The field of radiation oncology allows Dr. Editha Krueger to oversee the care of cancer patients undergoing radiation treatment while adapting to the ever-changing technologies in the field. This mixture of patient care and technology allows her to monitor patient progress and adjust treatment to ensure quality care throughout the process. By working closely with other physicians and all members of the radiation oncology team, Dr. Krueger develops and prescribes individualized treatment plans. Dr. Krueger is an expert in IMRT, a treatment method by which highly focused radiation is delivered to tumors while simultaneously reducing radiation exposure to normal tissues. 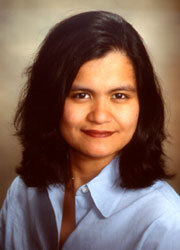 She has published several papers on the use of IMRT in breast cancer. She was also the principal investigator on a study analyzing the lung tumor movement and developing more effective techniques of radiation delivery during the breathing cycle. Dr. Krueger also prescribes non-sealed radioactive sources (Iodine-131, Strontium-89, Samarium- 153 and Phosporus-32) as well as radioimmunotherapy (Zevlin and Bexaar) for the treatment of malignant diseases. Experimental therapy options are available through the Radiation Therapy Oncology Group Trials at Thedacare. Dr. Krueger received her medical degree from Loyola University Stritch School of Medicine in Chicago. She completed her internship at St. Joseph Mercy Hospital in Ann Arbor, Mich., and her residency at the University of Michigan in Ann Arbor, serving as chief resident in her final year of training. Dr. Krueger distinguished herself early in her career. She received the Radiologic Society of North America Resident Research Award in 2002, and published papers on breast cancer and intensity modulated radiation therapy (IMRT). Prior to joining Radiation Oncology Specialists of Radiology Associates of Appleton, Dr. Krueger was a lecturer in the Department of Radiation Oncology at the University of Michigan. She is board certified in radiation oncology, and is a member of the American Society for Therapeutic Radiology and Oncology, American College of Radiology and American Society of Clinical Oncology. She serves as Medical Director of Radiation Oncology.